Discussion in '2nd Gen. Tacomas (2005-2015)' started by RedTaco21, Sep 27, 2010. Just installed it over the weekend. Now i have questions about what tire sizes i can fit on it! Toytec has a lot of lifts... Which one did you get? if you're atleast 2.5 front you will fit 285/70/17 at tires on 17x8 4.5 backspacing wheel. I had slight rubbing but after removing the front mud flaps all is well. 3" would clear. 285 mud tires with slight rubbing and trim might be needed. im just looking at different set ups. what do you think the best tire is for the job. haha I know I know im uploading it right now! true but why go looking through when you can just ask! 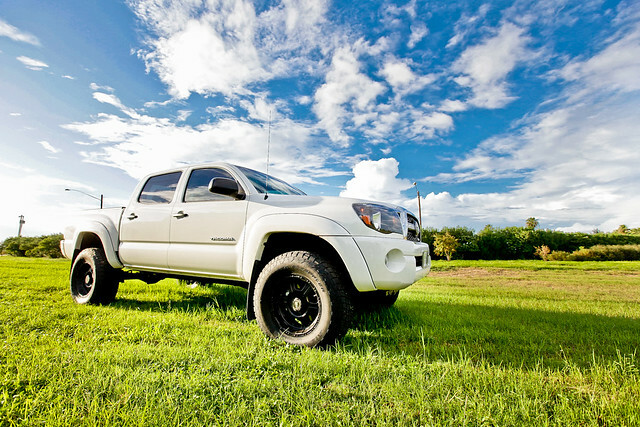 hbryanlopez....nice tacoma. I have a white one also wit 3 inch procomp lift wit 20" rockstars and 33 toyo mt's. i just signed up on this forum 2day and i still trying to figure out how to work all this stuff. I dont know how to post any pics or anything yet but i will try and post some tomorrow. Do you have to have a camera or can you use your cell phones? How did u black out your head lights? I bout to tint my tail lights and paint my badges black. I would like to black out head lights but i dont know how. what i did was i took the pics with my iphone, uploaded them to a photobucket account, then what you do is choose the IMG html and copy and paste on to your post. easy as cake. Is there any way that what we are talking bout saves or do u have to find the ppl you were talking to? thanks man yea i was liking the nitto's because my truck is gonna be more of a street car onlytime im gonna hit the dirt is when im going riding..
they actually look nice and aggressive. the thread on the nittos are sweet. JSG i took this photo on small jpg and did a quick edit. next week ill have some better photos ill pm you a link for the larger files. Thanks hbryanlopez, you prob just made my decision! they do look great and they would prob look great on my truck! @francis the BHLM looks really nice! one of my headlights is broken so i just ordered two new ones already with black housing!